You are the Rider. It is your job to rid Fthirnic Sol's moon of the evil Xile and its minions. You control a flying device of war that flaps (like the title suggests) like a bird in order to remain aloft. Battle the huge Xile Pyramids and flying batlike minions in your quest to free a dying moon. The main goal of the game is to destroy all of the Xile Pyramids on each level, and then finally to destroy Xile itself.You use a the arrow keys to control the movement of the Rider. You gain altitude by pressing the UP key repeatedly. The controls are very similar to those used in the arcade classic Joust (see the forum arcade). 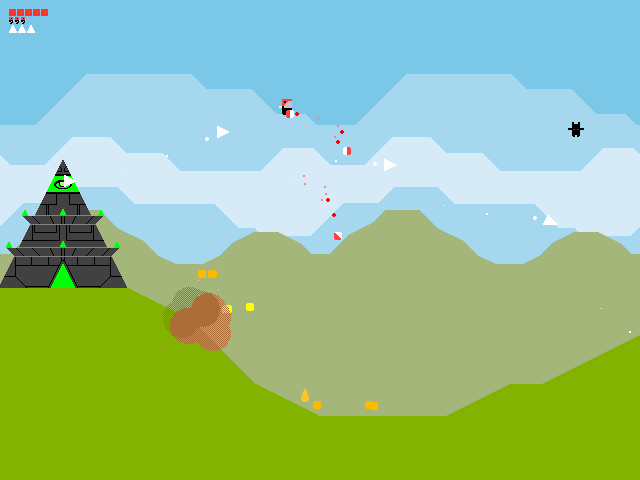 You are equipped with an infinite supply of Bombs and Lasers to aid you in your quest to destroy the Pyramids. The Rider has a health meter and a set number of lives per level. If you run out of health, you lose a life. If you run out of lives, then it is curtains for the moon of Fthirnic Sol. I thought this game was done with a very nice minimalist approach. None of the graphics have a great level of detail. The thing that pulls this simplistic graphics style together is the attention to detail in the special effects. The explosions are a brilliant use of particles that give a sense of life to the simple animations.My personal favorite level is the dark level. The black enemies blend perfectly with the background to give them a sinister feel. The use of color pulled this game together nicely.The lack of music in this game never really bothered me. The sound effects would be muted by the presence of music. They are perfect retro blips, bleeps, and booms that go together in a rather pleasant fashion.I thought this game was a pleasant experience, and I think anyone looking for a change of pace will enjoy it. Blast the Xile off the moon of Fthirnic Sol using your bombs and lasers. Four levels and a boss stage to complete. Note: Use the Z key at the menu. Recommendations: The 39 people who like FlapFlapFlap also like the following games. This game will forever have a special place in my heart. Fantastic game. Maybe could be longer. Maybe more could be done with the enviroment. But, it's a classic. finally, some innovation! Don't know why it took me so long to download, but finally I overcame the odd title and gave it a whirl. It's not going anywhere for a good long time. We r the knights who say ni!! i like it, i wanted more levels, and the last level was too easy. 10/10! Arr matey arr, even after so long, this game's still got its touch! Plus, now I can actually vote on it! Higgins was a normal birdman. And he had to kill bat maru and Temples that shoot albino doritos to savve his people.He was very hard to control, and slid around a lot, but he looked as sharp as katamari damaci and the sounds were classic, and fun. A HIGHLY original game with very detailed and UNIQUE graphics!!! The movement is different from any other GM game I've ever played before, and the graphics reminded me of many Flash animations I have seen. migileke, where is that secret spot on level 3? Waaaahhhh!!! For some reason I cannot download the game now! And it was so good... WHY?!?!? This game is fun!! !I m just bad at it,since I get stuck on level 3...But its fun! Yes. Great game! I love your style of the graphics, Lackey, and the effects are really nice too! Very good level desing and good enemies. You should put more levels in FlapFlapFlap 2, if you do next version. My favorite is maybe the dark level. The coulds are SO nice... but overall, great job! Indeed, this game is very impressive for a first game, and very impressive in general. Good job. This game reminds me of seiklus in some way that i can't exactly place. I've had a lot of fun with this game, in any case. I can see the jph wacheski (lockOn, seeds, etc) touch in some of the graphical effects. This is very impressive for a first game. Try it. I can think of a few rude things to say, but won't. In a nutshell it was wonderful! The humour is lovely, the attention to detail on things such as the particle explosions is sublime, and the gameplay is ... well ... lovely :). It brings back memories of the ancient DOS game Snipes, to me, only it's far superior. My only problem was that I had it finished on the first game after ten minutes. A very intense and focused ten minutes, of course. Sitting there with my wife, the only thing I wanted was a 'long' version with many levels and greater difficulty and a place where I could buy it (hint hint). Ian forgot to post his comment! He said... that he played it for 10 minutes! WHOA! This game is superb if Ian even bothers to type one key! In my opinion, he's the world's best Game Rater. My previous message was just trying out an accent. 'Allo. Zees game, she is zuperb! I vill be getting zome inspiration from zees, maybe? Quite challenging, I muzt zay! Ohoho... I had some trouble vith zee buttons as vell! A good game, very addictive, definitely worth a play or two... its only draw back is it very difficult. I cant get past the menu. Aren't you supposed to press enter to select? Cause it does't work for me.